Pioneers in the industry, we offer metal rubber coupling, gear coupling, rubber spider coupling and aircraft rubber part from India. Gear Couplings belong to the category of flexible couplings that are capable of transmitting very high torques. Constructionally the gear coupling utilizes the advantages of gear engineering; practically the coupling is a complete gear assembly. Gear couplings are torsionally rigid and are supplied to two designs – completely flexible and flexible/rigid. 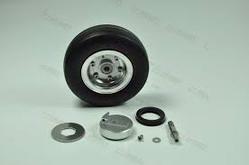 A completely flexible coupling comprises two hubs with an external gear and two outer sleeves with an internal gear. It's a universal coupling for all sorts of applications and accommodates all possible misalignments (angular, offset and combined) as well as large axial moments. Machines, bearings, seals, and shafts are therefore not subjected to the additional forces, sometimes of considerable magnitude, which arise from unavoidable misalignment usually associated with rigid shaft couplings.A flexible/rigid coupling comprises one flexible geared half and one rigid half. It does not accommodate parallel displacement of shafts but does accommodate angular misalignment. 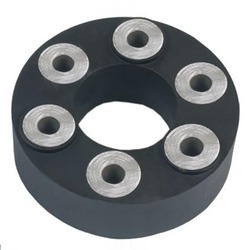 This type of couplings are primarily used for "floating shaft" applications. 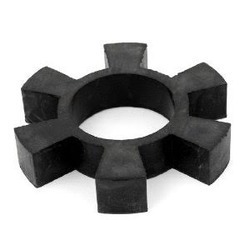 With the help of our professionals, we have been engaged in offering our client with excellent quality Rubber Spider Coupling. Manufactured with the help of advanced technology by making use of using excellent quality rubber, this grommet is tested on various quality parameters by our quality experts. 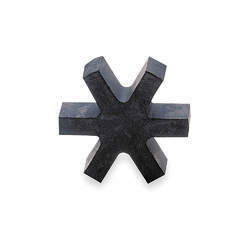 We offer this grommet in various specifications to meet specific requirements of clients. This grommet can avail from us at industry lading price.